The Simple Good is proud to stand among our community partner organizations filled with people who not only agree with The Simple Good vision but also ensure that youth are supported at all stages of their lives. One of our Community Partners is the Chicago Children's Advocacy Center, a fellow non-profit that coordinates the efforts of child protection staff, law enforcement professionals, family advocates, medical experts and mental health clinicians under one roof. 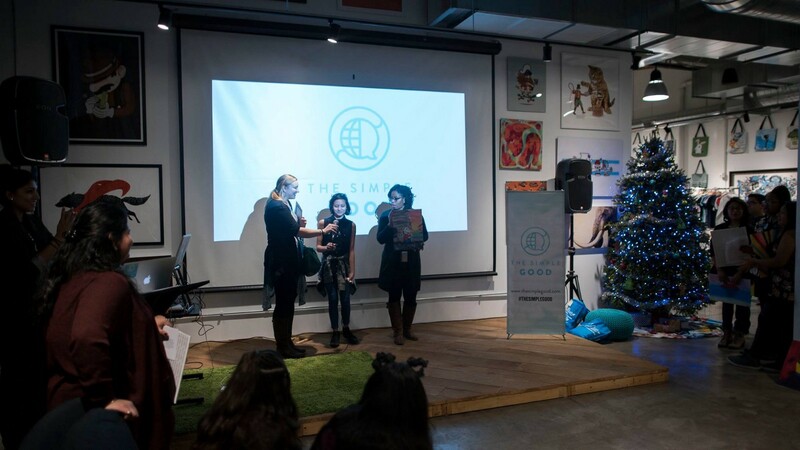 Laura Boillot, who is the Clinical Supervisor at the CAC has been working with The Simple Good to use our curriculum to empower youth through visuals arts and discussion at the CAC. As a long standing advocate for The Simple Good I wanted to know more about Laura, what she does for the CAC and what she thinks about The Simple Good. We had a great conversation and I’m glad I can tell you all about it! How did you come into the field of Therapy and Child Advocacy? Like most of us Laura has had a few detours on the road to finding her passion, I asked her where she was inspired to pursue such a challenging career and she looks owes it to the history of her own trauma and believing in healing what she calls “ruptured attachment”-reconnecting victims with healthy functional caregiving systems. During her time as a student at Hope College, she had debuted doing public defender work as a Mitigation Specialities Intern in the Defender Association of Philadelphia. She completed her undergraduate education with a degree in Criminal Justice with a focus in Psychology. She then went on to accumulate vast leadership experience in the non-profit sector by overseeing initiatives for The Center for Women in Transition, and The Pediatric AIDS Chicago Prevention Initiative- to name a few. She continued her education in tandem with furthering her passion to uplifting others by completing her education at Adler University in Chicago with an MAC in Counseling Psychology. After being a therapist at the CCAC for 6 years, she now oversees a caseload of clients across the Chicago area and assists a team of therapists with tools to further assist their clients. How Do You Stay Resilient? CCAC as a whole handles thousands of cases at a time. Most of the families they counsel are experiencing traumatic circumstances and are taking steps to repair that harm. Considering the gravity of the work Laura deals with I had to ask her just how she manages to stay inspired and resilient among these cases? When she first began her work ethic wanted her to take on a lot, and go above and beyond for everyone she could. But she encourages her peers to “pay attention to how the work impacts you” and use the necessary reflection work to help cope with all that you hear and assist with. That comes with accepting the fact that you may not be able to do everything, but be satisfied with doing something. Why Do You Think Programs Like The Simple Good are Important? Teaching resilience in the midst of adversity is what The Simple Good does best. It’s no wonder that TSG and the CCAC’s partnership was such a strong fit. It’s been two years since The Simple Good has been doing experiential art programming with CCAC’s clients with the support of CCAC staff like Laura. Laura values The Simple good curriculum after seeing “how it’s helped with her kids feeling connected to a greater whole”. She loves how the program creates a “free environment for kids to be creative without judgement.” Her favorite part is the showcase and how it “gives kids a sense of hope and connection in a professional and beautiful setting”. I went on to say its like we’re giving kids what we lacked growing up and she ecstatically agreed. Laura and I had an amazing conversation, she’s an incredibly intelligent woman with a passion for helping others. When asking her what her Simple Good is, she pointing out this conversation was a perfect one! It helped remind her of the motivations behind her position working with kids to still remain expressive after they’ve been through so much. But beyond this conversation Laura uplifts the Simple Good of community, one that she strives to repair and foster everyday. If you want to learn more about Laura and the CCAC visit their website and Facebook Page! A non-profit whose mission is to connect the meaning of good from around the world to empower youth to become positive activists via art & discussion.